Helen’s Birthday Giveaway is HERE! Helen's Food Presents: “Upload and Win” Food Competition! To Participate, you MUST adhere to the following: - LIKE @helenzfood on Facebook & Follow on Instagram - Cook Any food of your choice & do the following: - Take a full, clear picture of the food - Take a picture of you carrying the food - Take a picture of the ingredients - Prepare a detailed recipe for the food with a corresponding title - Post at once, ALL pictures and the RECIPE on @helenzfood - -- Facebook Page from Sunday, 14th April – Wednesday 25th April, 2019. -- Invite your friends to LIKE & FOLLOW @helenzfood on Facebook and Instagram, respectively. *** Three (3) LUCKY Winners will Emerge! 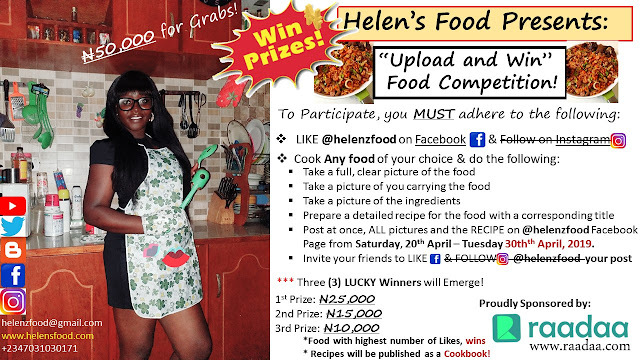 1st Prize: N30,000 2nd Prize:N20,000 3rd Prize: N10,000 *Food with highest number of Likes, wins * Recipes will be published as a Cookbook! This Competition is Proudly Sponsored by Raadaa.com About Raadaa: Raadaa is a platform for creating, sharing and fining all types of academic papers – from research to theses, articles and fiction. Hurry NOW! Publish your stories, research papers, theses, term papers, video clips, etc on Raadaa platform and make cool money! *If you wish to join in the sponsorship of this competition to accommodate more winners, please call or WhatsAPP me on +2347031030171 You can also do a message. Thanks for making my birthday memorable this 2019!